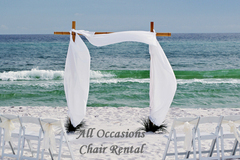 We rent white, padded folding chairs for wedding ceremonies as well as all occasions. We value your trust and want to take the 'chair worries' out of your event. Our service and dependability as well as our low, competitive prices make us the first choice in chair rentals.